I’m not going to faff tonight. Its been too long without one of these posts. Lets just get down to business! 3. This lovely vintage inspired playsuit. It costs £48.00 from Urban Outfitters. Yes its a lot, and yes I could probably find a real vintage one for a fraction of the price, but isn’t it pretty!? 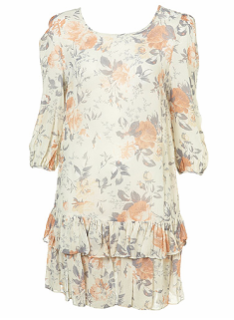 I love the delicate floral print, and I think teamed with tights and shoe boots at winter, or bare legs and brogues when the weather warms up, it is a perfect piece for any girl’s wardrobe! Find it HERE, and wear it with…. 2. 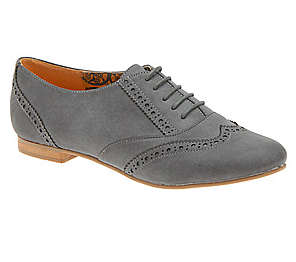 These beautiful brogues. What caught my eye about these is the colour and fabric. This style of shoe is cropping up everywhere now, but I think this is a nice change from the usual black patent leather, and makes them easier to wear as they have a more casual feel. These are from Aldo and cost £40.00. They would look as good teamed with some frayed vintage Levi shorts and a baggy tee, as they would with a pretty dress and ankle socks. Perfect 🙂 Find them HERE. 1. Another find from good old Topshop. I had a look at the ‘New In’ section of the website the other day, and this jumped out at me straight away. I love the print, the colours, the shape, everything. Its the perfect summer dress, and if I get paid a decent amount then I might be inclined to buy this. We shall see though, as it does cost £45.00. Eek. It is lovely though..and I do get staff discount…Find it HERE! I’ve bought some lovely goodies in the past few days too, so I will be sharing some of those with you all very soon!